It's a bird! It's a plane! It's Water Bullet! 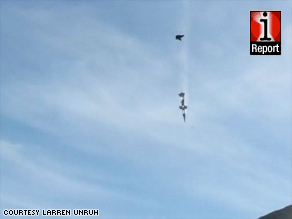 iReporter Larren Unruh submitted video of a test drop of the MX-311 Water Bullet. Larren Unruh sent iReport.com a cool video of the test drop of a device called the MX-311 Water Bullet, a high-impact safety harness. Watch the video here. Inventor Maximus WillHammer has spent the last five years working on it, motivated by what he considers a lack of understanding in the safety industry of the needs of today's tradesmen. 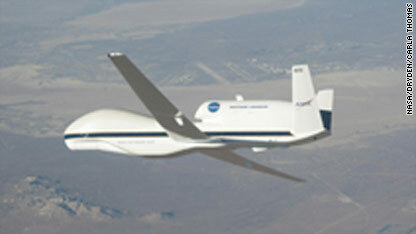 The aircraft was designed around the idea of finding a safer way to bring data or humans back from space. The video shows WillHammer's unmanned test drop earlier this month at the Arrowrock Reservoir outside Boise, Idaho. Check out Willhammer's Web site for more on how it works. Tell us about a technology breakthrough, and your video could be featured on this blog. I'd seen the news stories of past zero-gravity flights. I'd watched the instructional video. I'd received personal coaching. I knew exactly what was going to happen when the plane hit that first parabola and made earth gravity go away. Still, my brain was telling me, "This can't really be happening!" when my body floated off the floor of the 727 for the first time. I was producing a story on how Northrop Grumman is chartering a specially-modified jet to take teachers on zero-gravity plane rides. The idea is to have math and science middle-school teachers conduct experiments during a once-in-a-lifetime weightless flight, and have them take that thrilling experience back to their students, inspiring and motivating a new crop of scientists, astronauts, and engineers. We'll bring you that story in the near future. But while I'm still in the grip of my zero-G hangover, I thought I'd share my personal encounter with weightlessness. The day started before dawn at a hotel just outside the Atlanta airport. Reporter Reynolds Wolf, cameraman Jonathan Schaer and I met up with 30 teachers and the "floatmasters" (my term, not theirs) who would guide us during the flight. We were provided a breakfast of pastries and fruit. The floatmasters recommended avoiding dairy, protein, and excessive caffeine. They had also recommended not drinking alcohol the night before. (Not a problem for me, but I could see how a more nervous person might want a shot.) All of this, of course, was to avoid turning the flight into a "vomit comet" - the nickname of the parabolic flight jet used for training astronauts. We were all issued navy blue jump suits with "G-Force One" patches. We watched a training video that repeatedly drilled into us: Don't Jump, Don't Kick, Don't Swim. During weightlessness, jumping will send you into a neck-crunching collision with the plane's padded ceiling. Kicking is likely to connect painfully with a nearby zeronaut, as we were called. And swimming just doesn't move you anywhere in zero G - it just makes you look silly. We took shuttles to the small private terminal serving the flight and passed through TSA security just like ordinary, gravity-tethered travelers. Then, like the pioneering spacemen of "The Right Stuff," we strode to our craft - a modified 727 dubbed "G-Force One." We entered via what in a conventional plane would be the rear emergency door. The jet had seven rows of seats in the back. The front 2/3 of the plane was an open area, with thickly-padded walls, floor, and ceiling. No windows, except in the emergency exits. Soon, we were off for a half-hour or so ride to airspace over the Atlantic. 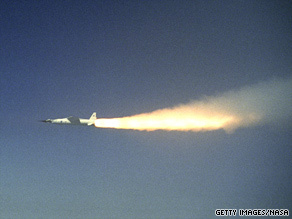 A 100-mile-long, 10-mile-wide area, 24,000-32,000 feet in altitude, is dedicated to these parabolic flights. Parabolas are essentially arcs. As the plane flies up the arc at a 45-degree angle, passengers feel increased gravity, about 1.8 times that on earth. But when the plane crests and starts down the arc you get reduced, or zero, gravity for about 30 seconds. To acclimate the passengers on our flight to zero G, the first parabola created the 1/3 Earth gravity environment of Mars. The second and third parabolas created the 1/6 gravity of the moon, and the last 12 were the real deal - weightlessness. The teachers chatted and laughed excitedly on the flight out, even cheering "Wooo!" and "Yeah!" when the plane dipped unexpectedly. Turbulence on a normal flight might make you nervous. But on this day, it seemed to be just a foretaste of the great adventure to come. As the time for the first parabola neared, we were told to lie down on the floor and stare at a point on the ceiling to avoid disorientation. The increased gravity wasn't as bad as I thought it would be - it was like a heavy weight pressing on my head and chest. Then a floatmaster cried out "Martian One!" to warn us that the first Mars-gravity episode was approaching, and my body started feeling really light. (On Mars, a 150-pound person would weigh only 50 pounds.) Laughter and shouts of amazement filled the plane. People stood up - some bounding up, despite our "Don't Jump" orders. Thank goodness for the padding. Teachers were dancing like out-of-control marionettes. (Journalists, too.) Some folks did one-handed push-ups – easily! Then, all too quickly, the order "Feet down!" rang out and we had to lie flat again. The next two parabolas, "Lunar One" and "Lunar Two," made us feel 1/6th lighter than on Earth. You could pick your feet up off the floor and float gently down (unless your out-of-control neighbors were falling or flailing into you.) I, of course, was one of those out-of-control neighbors. Then, weightlessness. The Zero Gravity Corporation brochures liken the experience to a zen-like, exalted state of bliss. But for the teachers (and journalists) on our flight, I think there was too much fun going on for anyone to experience zen. You had absolutely no control. If you got yourself moving in one direction, you couldn't stop until you hit something. Bodies were bouncing off the walls, floor, ceiling, each other. 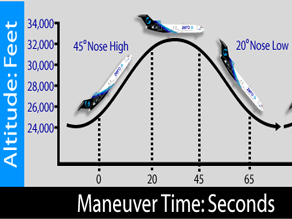 The first few zero-G parabolas were absolutely hilarious - chaotic, but hilarious. Every face had a broad, silly, marveling grin. Well, nearly every face. By the end of the flight, a few teachers - I counted eight out of the thirty - had returned to their seats, fighting the effects of motion sickness. I didn't see any evidence that the flight had actually become a "vomit comet," but these folks definitely were not feeling well. Not a lot of science got done in those first few parabolas. Folks (including Reynolds, our correspondent) flew through the air like Superman. Teachers played catch - using each other as the ball. We tried to eat flying M&M's and drink floating globs of water. But during the last several parabolas the educators did complete at least some of their experiments, which tested Newton's Laws of Motion. Throughout all of this, my photographer, Jonathan, wrestled with his camera, which was mounted inside a steering wheel-like device to help him maintain its stability. Even when we were supposed to be lying prone, Jonathan remained sitting, and sometimes standing, so he could get the best video he could. And he didn't get sick. Neither did my correspondent, Reynolds, who even photographed his unused airsick bag as proof. When the floatmasters yelled "Feet down!" during the last parabola, I wanted more. But as we were flying back to Earth, I started feeling a bit of malaise. I then figured that maybe the floatmasters knew what they were doing, stopping at 15 parabolas. (NASA's "Vomit Comet" flies 40 or more per flight.) Others may have felt the same way; the teachers were much quieter on the way back, perhaps reflecting on their Superman leaps and successful experiments - or perhaps just waiting for heads to stop spinning and stomachs to settle. Even today, the day after, I still feel sort of dragged out and a bit fuzzy-brained. But I would do it all again in a heartbeat. You could do it, too - for a price. The Zero Gravity Corporation makes regular flights out of Kennedy Space Center, Florida, and Las Vegas, Nevada. They cost five thousand dollars a seat. 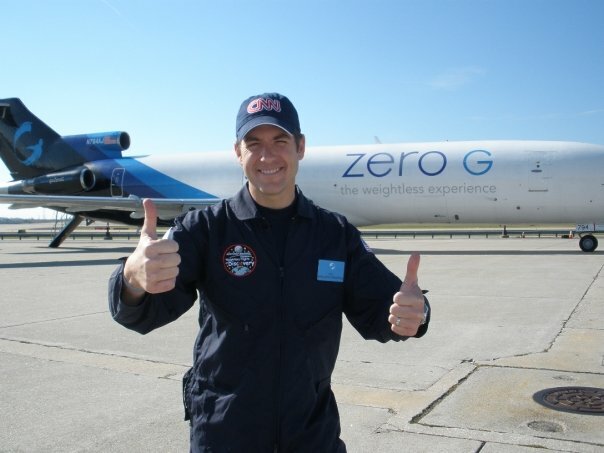 So, assuming you have a spare $5,000. . .would you have The Right Stuff to do zero G? Just about a year ago, I flew my small plane to the Minden, Nevada, airport to pursue a story on the search for Steve Fossett. I taxied my plane up to the terminal, walked into the service desk at the Fixed Base Operator (FBO) and found myself smack dab in the middle of a planning session for the search team. 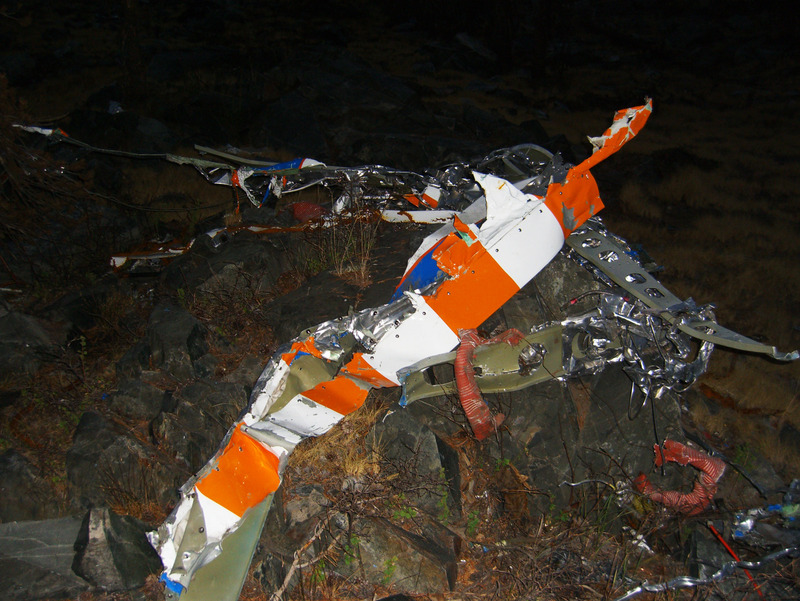 Wreckage of Steve Fossett's plane, found in the California mountains. They wondered how I got in there (the rest of the media was cordoned off in the parking lot). “I flew…and boy, are my arms tired,” said I. The room broke up, and next thing I knew I was talking with Cynthia Ryan of the Civil Air Patrol. I asked her if she would be willing to fly with me over the search area and within an hour or so we were airborne, with a shooter in the back seat flying low and slow over rugged mountains. It was quickly evident how big and daunting that haystack is out there. When most people think about the desert, they think of the Sahara –- you know, an endless sandbox. The desert on the Nevada-California border is not nearly as blank a slate. The hills are rugged and covered with sagebrush - except near the occasional river, which supports thirstier flora. On top of that, Nevada’s mining heritage has left the ground littered with all kinds of detritus – old jalopies, mattresses, rail cars and the like. Their glints in the sunshine were constant, distracting red herrings. And in fact, the searchers discovered a few old plane wrecks that had been missing for many years. You can see the piece I aired on September 7, 2007, here. Most of us had a hunch at the outset that Fossett flew into a box canyon and smacked a mountain at a high rate of speed, leaving little for searchers to spot from the air. They say you should always go with your first gut instinct on these things –- and so it goes in this case. We are left with the sad irony that a man who took so many risks and survived so many close calls in perilous situations fell victim to an sightseeing tour in a docile plane close to its home on a holiday weekend. In his book, Fossett writes at length about his meticulous planning and careful attention to detail. He was very precise in calculating the risk –- and was really not a daredevil. But aviation is very unforgiving of complacency, and that airplane and that canyon were not impressed with Fossett’s record of amazing accomplishments. No one is bulletproof –- not even Steve Fossett. The highly trained military aviator moves the stick right and rolls in on a target— an Al Queda training complex in Iraq somewhere near the Syrian border. Source: Getty Images. 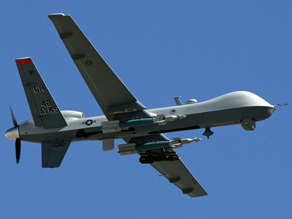 UAVs, like the Predator, have already logged over half a million flight hours in Iraq and Afghanistan. The pilot selects Hellfire missiles, pulls the trigger, and blasts the installation into oblivion. He then pulls up, sets course for home, slides back in his rolling chair and takes a sip of coffee. He is sitting in a dark room almost 6,000 miles away from his aircraft. Step aside Maverick and Goose. This past March, the United States Air Force announced it will be seeking an increased budget for unmanned aerial vehicles, or UAVs, from $334 million in 2008 to $540 million next year—a 60 percent increase. If military decision-makers have their way, the heyday of aerial dogfighting performed by hot shot pilots will be a thing of the past. UAVs already play an integral role in the country’s current conflicts, having already logged over half a million flight hours in Iraq and Afghanistan. Given these surprising statistics, many military pilots fear that their jobs may be in jeopardy. It’s borderline science-fiction to think that a pilot, who has trained for hundreds of hours, could be replaced by an autonomous flying machine. A close friend of mine, a midshipman at the Naval Academy, is convinced that he’ll be among the last generation of military pilots that will actually fly an aircraft from the inside. But are military strategists letting their enthusiasm for unmanned vehicles run wild? Some want to begin to employ autonomous robots capable of making their own kill decisions—a scary prospect for industry experts. 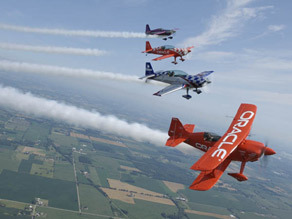 In friendly skies over the United States, non-military pilots are concerned about UAVs, too. During my first flying lesson, my instructor taught me the simple skills required for dodging mid-air collisions: “see and avoid” he called it. But as UAVs take on more roles in law enforcement, border patrol, aerial surveying, and other peacetime missions, how well will they see, avoid, and communicate with other aircraft in the nation’s already busy airspace? That’s still to be determined. The Frederick, Maryland-based Aircraft Owners and Pilots Association (AOPA), a lobbying group for pilots of general aviation airplanes, advocates that any UAV integration into the national airspace system must be conducted without any harm to the current civilian airspace user. As a pilot myself, sharing airspace with remote-control flying machines gives me the heebie jeebies. Still, the FAA has not outlined a definitive plan on how to deal with manned and unmanned aircraft sharing the same piece of sky. Will the future of aviation remain human after all?